Sisko and Dukat work together to prevent the Cardassians and the Maquis from starting a war. It's interesting seeing Necheyev once again second-guessing Picard's decisions, in this case his choice to let the settlers decide their own fate. It's also interesting seeing how she interacts with Sisko, who can be just as brusque as she is. The dialogue in this episode is amazing. I particularly love Sisko's "it's easy to be a saint in paradise" speech. DS9 is definitely getting comfortable testing the boundaries of what is acceptable in a Star Trek show. I like that Sisko and Kira come to a complete understanding of one another after their big fight in the previous episode. The first conversation between Sisko and Dukat on the station is another good example of amazingly well-written dialogue. It's perfect how the whole thing hinges on the concept of Cardassian justice, how Sisko is able to set Dukat up and then knock him down with his own words. I also like the last lines they say to each other at the end of the episode: "You disappoint me." "Don't expect me to lose any sleep over it." The dogfighting scenes are much more choreographed and interesting than most other space battles we've seen in non-film Star Trek. The writers have done a masterful job in making Dukat a complex, multi-dimensional villain. He's been portrayed as a psychopath in previous episodes, but here, he really does act like one of the good guys, and he does help defuse the situation, even if he does it in his own way, begging everyone around him to act in a more blood-thirsty manner. 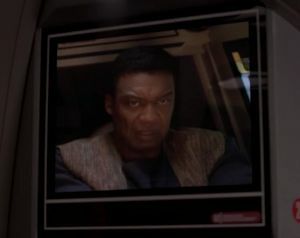 I'll be honest and admit the overarching Maquis subplot has never been one of my favorite plot threads in Star Trek history, but this episode--particularly "Part II"--is where it justifies its existence and its place in the canon. Giving Sisko a lifelong friend who abandons Starfleet to join a terrorist cause, and then having the two of them try to convince each other to join the other side, is extremely compelling, and it helps to flesh out Sisko in a new way. It's another step away from Roddenberry's utopic vision of the future--showing a seedier, darker side to the Star Trek universe--but it still feels like it belongs. It feels relevant--in a political history kind of way--and it manages to be compelling and provocative by not letting the audience make any quick judgments about who is right and who is wrong.